The Michael D. Eisner College of Education, in partnership with the Ed.D. 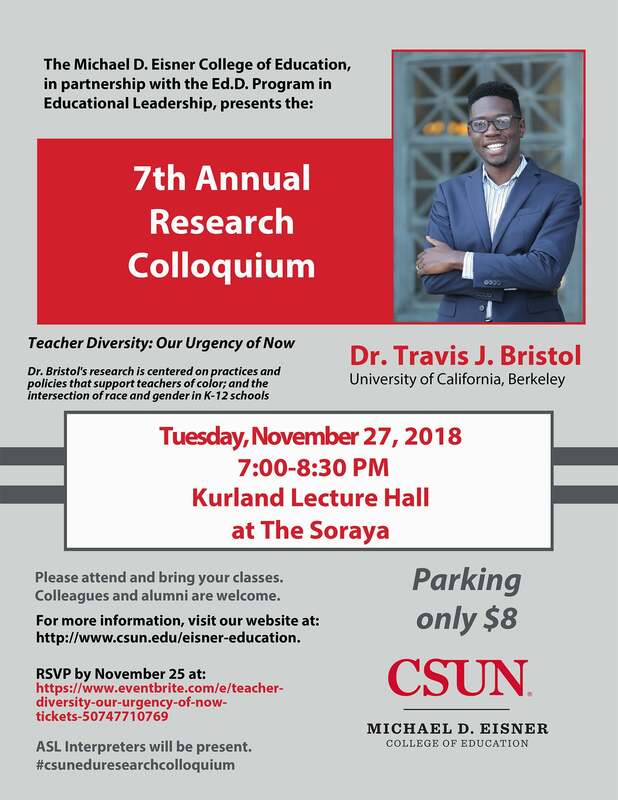 Program in Educational Leadership, presents the 7th Annual Research Colloquium, with special guest speaker Dr. Travis J. Bristol. Dr. Bristol's research is centered on practices and policies that support teachers of color; and the intersection of race and gender in K-12 schools. Please attend and bring your classes. Colleagues and alumni are welcome. ASL Interpreters will be present. Diane Gehart of the Department of Educational Psychology & Counseling has been selested as the 2017-2018 Michael D. Eisner College of Education Research Fellow for her project "Mindfulness in K-5 Education: A Comprehensive Program with Online and In-Class Mindfulness Training for Students, Teachers, and Families"